Wallpaper is one of the ways of making a statement in a room. 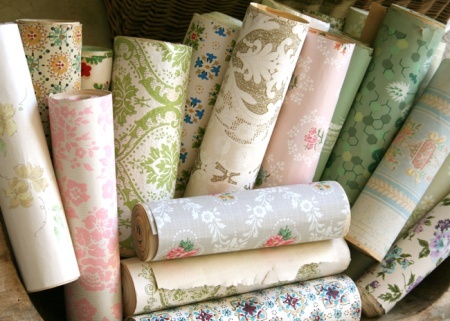 However, you will want to choose something simple if you are a beginner when it comes to wallpaper. Leave the ones with intricate patterns until you have a little more experience. The reason for this is patterned wallpaper has to be matched at each seam if you want a look that is uninterrupted. Believe me, finding this out the hard way is not a pleasant experience. I have always loved the look of wallpaper. There is just something about it that seems to add a style to a room that in my opinion is classier than painting. Figuring that anyone could hang wallpaper, I decided to do my kitchen with blue wallpaper that had a strawberry pattern. The look of the flowers, strawberries and leaves just had a great look that went very well with the cabinets. Thank goodness this was prior to moving in so I didn’t have a lot of furniture in the way. The papering started off well. Apparently I got the first couple going the right way, but when you are standing on top of the wallpaper pressing it to the wall, the pattern does not look the same as when you stand back to take a good look. I had a vague idea that it would have to be continuous but I did not realize the strawberries and flowers were not the same the whole length of the wallpaper. Some were shaped differently and varied slightly. But this variation did not seem so slight when you backed up and looked at the wall. Needless to say, this was not what I had pictured when I envisioned the beautiful look the wallpaper would give my kitchen. One thing you have going for you when you notice this right away is most of the wallpaper is still damp because it usually takes it at least overnight to completely dry. So, what started out to be a project to hang wallpaper turned out to be a removal project. The wallpaper all had to come down, so I could start all over again. One lesson I learned is always buy extra wallpaper. Getting all the wallpaper off the wall and starting all over again was not much fun, but I was determined that no one see the mistake I had made. Of course, naturally someone would have to walk in about the time you begin taking it all down. Luckily it was my husband and he really did know how to hang wallpaper. So, he gave me a few pointers about cutting the wallpaper a few sections at a time before preparing it to hang. This way you can lay it down on a flat surface and see how the pattern matches up. Another thing to remember is wallpaper will stretch somewhat when it is wet. So, when you are putting the pieces together to match up the design, do not pull on the paper or this will throw the design off as well. Another thing, always leave a little extra at the bottom and top so you can trim this off rather than have it dry and leave part of your wall exposed. Now I know how to match patterns so the wallpaper appears seamless. This was a valuable lesson and now if someone says anyone can hang wallpaper, I have to say yes, anyone can, but they can not always hang it correctly. If you have an article that you would like to publish, then you may submit an article and it will be listed on this site.